A few years ago, I’ve started to notice that I was clenching my jaw and tightening my face and neck while behind the wheel, even when there was no obvious source of stress. I realized that just the act of sitting in the driver’s seat was enough of a stimulus to cause me to create some unnecessary tension in my head and neck – tension that rapidly spread to the rest of my body. Even here in serene Lincoln, Nebraska, recently voted the happiest city in the whole USA! I decided that driving was the perfect opportunity to give myself some useful Alexander Technique preventative directions. I found that negative directions worked best for me because in addition to being highly effective, they require very little mental energy and were less likely to take my attention away from my surroundings, whether I was driving on city streets or on the Interstate. In addition to the classic, “I’m not tensing my neck” I often use, “I’m not compressing myself” and, “I’m not tightening my face.” Sometimes, “I’m not frowning.” After a few weeks of this kind of self-directing I found that I was generally less tense while driving and that I could usually let go of any in-the-moment irritation when, say, another driver cut me off. Of course the same sort of thing holds for other forms of transportation like bicycles, buses, trains, planes and feet. Not to mention horseback riding, which F. M. Alexander, the developer of the Alexander Technique, was so fond of. They all provide wonderful opportunities to explore his discoveries. As one Alexander Technique student recently mentioned on Face Book, even while commuting on the New York City subway – “sardine city” as she nicely put it – a little self-directing can go a long way. Have you experimented with Alexander Technique directing while traveling? What did you notice? Did you encounter any unique or unexpected challenges? Great blog, Robert, and so apt for me this morning as I drove my husband to Philadelphia airport on the lovely interstate 95! I’ve noticed all the things you mention, in myself and others, when driving, and find Alexander Technique directions invaluable. 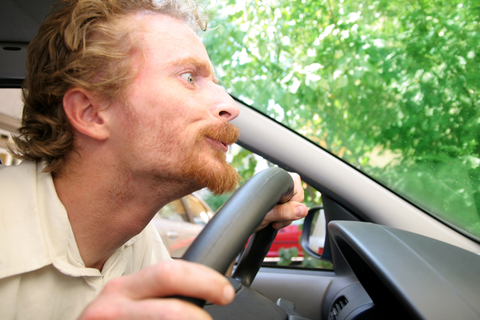 I’ve noticed, however, that I’m actually often more “stressed” when I’m a passenger in a car – i.e. when I’m NOT in control of the vehicle myself. This is a great time to use Alexander thinking/awareness skills of inhibiting and directing (and I agree, negative directions can be very useful indeed). You also have the luxury of being able to take your eye off the road! I’m not sure my husband would agree on how successful I am (!) at this, but I’m sure I’d be a mess without it! And even if it doesn’t stop the initial tension, I’m much quicker at letting it go – i.e. I notice the tension very quickly which enables me to take remedial action, and I’m not stuck with that tension for minutes, hours, or even all day! Interesting Imogen. And absolutely being a passenger in a car (or train, or plane..) is a wonderful time to use AT directions. Thanks for that Karen. I think part of the trick is to turn a less-than-optimal reaction into a plan for future action. If you know driving a new car is a stressor, just decide to take advantage of that and use it as a reminder to self-direct. Of course, it’s not always quite that simple, but having that background intention can often be very useful. Driving was one if my first opportunities to learn inhibition of bad habits. While driving I was learning how to relax. To my surprise, my spine was lengthening and I was adjusting my rear view mirror as I legthened. I still do this as part if my thoughtful awareness. It’s also interesting how end-gaining enters the equation. When we’re late, and walking, we poke our necks forward as if that’s going to get us where we’re going sooner. We’re “there before we’re there.” Same thing when we’re late, and stressed, when driving. If we need to get someplace sooner, sticking our faces forward 2 inches won’t help! Like the guy in your photo! Good point Mark. In general I think we exaggerate our worst habits when we’re under some stress, or when we go faster (walking/running for example) so it’s not surprising that the tendency to push our head forward increases when we’re in a hurry. I was on the train today, about an hour each way, and noticed how tensely I was holding myself on the way home when the train was very crowded. I did remind myself to put my feet directly on the floor, though late into the trip. Like Mark says, it doesn’t actually work to tense up! Tightening my shoulders didn’t give me any more room. BTW I love your “UP” mosaic! 7 plus or minus 2 memory slots is all we’ve got – taking the music away leaves room for something else. Yeah, what’s up with that limitation? Also find that it’s an interesting pastime to use the moment of the car taking off as a reminder to think ahead – moving ahead into the vehicle’s motion counteracts that tendency the car has to toss your head backwards as acceleration increases. I also noticed head movement has something to do with car sickness. Everyone in the car who isn’t sick will unconsciously move their heads to anticipate the curve ahead…and the person who is carsickly will not be moving their head, or be moving it in the opposite direction. If you can convince the person who feels sick to move their heads along with everyone else, they’ll feel better and be able to avoid car sickness from then on. Although I did drive sometimes when I lived in Brooklyn, it wasn’t until I moved to Pennsylvania 10 years ago that I noticed odd tension creeping into my use while driving. In poor weather conditions especially, I noticed a lot of teeth grinding and fist clenching. Stress reactions are so often the opposite of what is wanted–a death grip on the steering wheel gives me less control, not more. “Brace yourself” is terrible advice. I have been successful in eliminating most of these patterns and habits, by just paying attention to the breath and finding enjoyment in seeing how responsive I can be. When tapping the breaks in bumper-to-bumper traffic, for instance, I get a kick out of seeing other drivers contorting, while I say no to stiffening and pushing my head forward (like that’s going to get me there faster). I am so grateful to know the Alexander Technique; it is practical and powerful in everyday situations. Thanks for that Amy. Certainly breathing is a great thing to pay attention to. I use the AT negative direction “I am not breathing.” a lot these days. Hi Robert,Great blog! A new challenge for me is riding with my teenaged children as they are learning to drive. Talk about fear!!! I actually injured myself by retracting my head so far down into my spine, driving with my daughter for an hour two days in a row. My teacher training required a daily commute of 3 hours, some of them luckily carpooling with other trainees. I think the time behind the wheel during this crucial time of changing habits was in the end a real benefit. Practicing the Whispered Ah helped me to relax plus got me breathing. Exploring different hand positions on the steering wheel and the connection between shoulder blades, arms and hands is still invaluable – it really doesn’t matter which instrument I am playing or which tool I am using. Finding the right seat support to overcome the bucket shape of my rather small car keeps me alert to help my students adapt their car seats, the same goes for lumbar supports etc. And then there is peripheral vision plus aspects of relaxed seeing versus stained searching/ looking, …thanks for this post!